The Plot: Henry Jarrod is a gifted 19th-century sculptor whose wax museum is struggling because he refuses to recreate scenes of torture and villainy of the past. His unscrupulous business partner sets fire to the museum to collect insurance money on it, leaving Jarrod unconscious inside as it explodes. Jarrod, thought dead, reappears a few years later with a new wax museum. Now confined to a wheelchair and with badly burned hands, he relies on a pair of assistants to do the actual sculpture. Jarrod's old business partner is murdered, as is his girlfriend, and a young woman named Sue Allen witnesses a beastly, deformed creature commit the crime. When both of the corpses disappear, the police recognize something is afoot, but can't figure it out. Sue Allen begins suspecting that the bodies are actually on display in in Jarrod's museum, but has trouble convincing anyone else of such an outlandish theory. The Good, The Bad, The Indifferent: This movie is remarkable for several reasons. It's a prime example of 50s major studio horror, and a lot of fun. But beyond that, it a) kicked off Vincent Price's career as a boogeyman, b) was one of the first studio films shot in 3-D (which is the source of some of the biggest groans in the movie, including a famous ball-paddling barker), c) features a very young (and very ripped) Charles Bronson when he was still using his given name of Charles Buchinsky, and d) features Carolyn Jones, who went on to play Morticia Addams in The Addams Family. How It Stacks Up: This movie is a hell of a thing to try to get your head around. 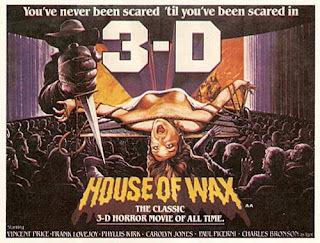 When it starts, it feels like House of Wax is going to be a straight remake. The opening scenes with the shady business partner and the fire in the wax museum are almost identical in the two films — down to lines of dialogue, camera angles, and particular stunts. But soon after, we meet spunky, fast-talking newspaper reporter Florence Dempsey. It seems like maybe she's going to be the Carolyn Jones part, and her roommate Charlotte (Fay Wray, of King Kong fame) will be the Sue Allen role, but it becomes clear that this is going to be more complicated than that. See, there's this inexplicable subplot about a wealthy heir in some fancy family who gets arrested for the murder of a socialite, but Florence is determined to clear his name. And then the murdered girl is the one that turns up in the wax museum...so who the hell is Florence? Over the course of the film, she somehow becomes the main character. Her bickering, you're-fired-you're-rehired relationship with her editor is a total head-scratcher. Then there's a lot of cop stuff that's the same between the two movies, and the climax at the museum is basically the same between the two versions. 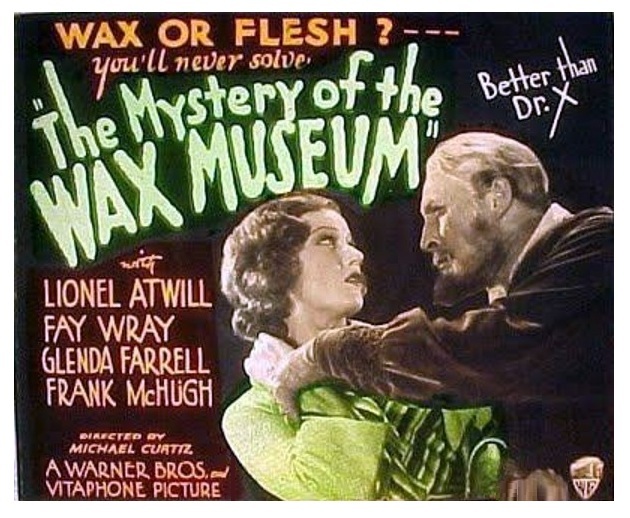 The whole thing was kind of a mess, but I finally figured out what was going on: believe it or not, Mystery of the Wax Museum is a horror re-telling of The Front Page, the smash Broadway hit from 1928 that would later be the basis for the Rosalind Russell-Cary Grant film His Girl Friday in 1940. You can be forgiven for thinking that doesn't make a lot of sense. Worth a Watch? 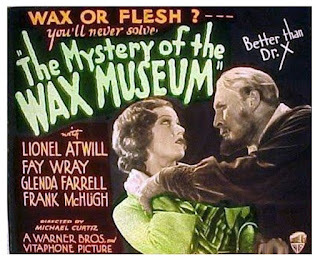 Mystery of the Wax Museum is a curiosity, at best. It was shot in 2-strip Technicolor, so it has a visual texture that only a few other surviving films have, and that's definitely something to see if you're interested in that kind of thing (I am). And in the role of Florence, actress Glenda Farrell does a dynamite job as a streetwise dame with moxie to burn. Her performance is maybe not the equal of, but certainly holds its own against better known performances by Russell and Jean Arthur. But in the end, this is two very different movies fighting to exist inside the space of 74 minutes, and it just winds up reminding you that there are much better versions of each of them readily available. Posted by Vance K — cult film reviewer and co-editor of nerds of a feather, flock together since 2012. Perennial watcher of dozens of horror movies each October.